Secure leaders delegate the desired results, not methods. When we delegate results, we are transferring responsibility for methods to those doing the work. When those doing the work determine the method, they take ownership in achieving the results. Since they’re responsible for methods and ultimately results, they are flexible and can change methods to effectively and efficiently achieve the desired results. Insecure “leaders” delegate methods in order to achieve the desired results. By doing so, they retain full responsibility for the results. When those doing the work are told what to do, they avoid ownership of the results. They are rigid and simply do as they’re told. As a result, whatever happens, happens. Secure leaders empower others by giving them the power to make decisions. The team members know they are responsible, but they also know the leader is there to support them. The leader comes alongside when needed, but doesn’t take over. The secure leader’s role is to facilitate decision making. Even when the team asks for help, the secure leader doesn’t give them answers, he leads by asking them questions. Insecure “leaders” disengage in the name of empowerment by giving others the “false impression” they have the ability to make decisions. The insecure leader is always hovering over and smothering “snoopervising” to ensure the right decisions are made. If they think it’s right, they say nothing. If they think it’s wrong, they re-engage and make the decision. Insecure leaders think their role is to make decisions. When the team asks for help, the insecure leader jumps in with the answers. Secure leaders know the power of empowerment comes when those on the team truly feel trusted. When they feel trust, they know they are ultimately responsible. They know the leader is counting on them to accomplish the mission. They know unless they ask for help, the leader assumes everything is on track. Insecure “leaders” exhibit false trust by disengaging and stepping back while attempting to make those carrying out the mission feel as though they are responsible. They only pretend to trust. But, they are never far away. They are always “keeping an eye” on what’s going on. If they see something questionable, they get involved and start making course corrections. Then, disengage again in the name of empowerment. Secure leaders expect the team to synergize. They empower others to determine methods because they know there will be unlimited synergistic solutions to problems as they arise. They clearly define the desired results and get out of the way. They expect the team to work together to develop solutions. Insecure “leaders” marginalize their team. They typically provide one unilateral solution. They are so busy making decisions for everyone that they don’t have time to listen to anyone. If their first idea doesn’t work, they provide another. They limit the team by not allowing them to adjust midstream when they realize there may be a problem. The team feels bound to carry out the leader’s order. Secure leaders want their team to do all of the thinking. They know that’s where and when they will grow the most. They understand all growth happens outside of the comfort zone. They often intentionally challenge their team members to find new solutions to old problems. Insecure “leaders” want to do all of the thinking. What’s interesting is you will often hear them complaining about their team, “I don’t know why they can’t ever think for themselves.” The reason is because the leader is always thinking for them. Whenever there is a mistake, the insecure leader hurriedly offers a solution. It’s like a parent that says, “I don’t know why my 17 year old can’t think for himself?” It’s because the parent has always told them what to do without helping them learn to think by asking them thought provoking questions. Secure leaders believe in their team. They don’t just say it. They demonstrate it. They don’t have to say it because their team members feel it. When you believe in others, it releases them to achieve what they may not have thought was possible. They are borrowing belief from you. When their team makes a mistake, the leader believes they learned a valuable lesson during the process. As a result, the team is much more likely to expose problems in order to correct and learn from them. Insecure “leaders” believe in themselves and discount their team. They question their team’s actions constantly. They shoot down their ideas regularly and frequently. Members of the team often feel anxiety while carrying out the mission. They are always wondering, “Am I doing it right?” They feel constricted by the pressure of doing it the leader’s way instead of their own way. When an insecure leader’s team makes a mistake, they are punished and ridiculed. In the future, the team is much more likely to hide problems out of fear. Therefore, instead of being addressed, problems are intentionally hidden. Secure leaders come alongside their team. They are not out front pulling. Nor are they in the back pushing. They are in a support role. They understand their job is to remove the obstacles for the team. They are the team’s biggest cheerleader. The team loves to have them around. Insecure “leaders” are always pulling or pushing their teams. Why? For the insecure leader, it’s not about the team. It’s about themselves. Their goal is not to grow and support the team during the process. Their goal is to get the results they want when they want them. The team hopes they don’t come around. 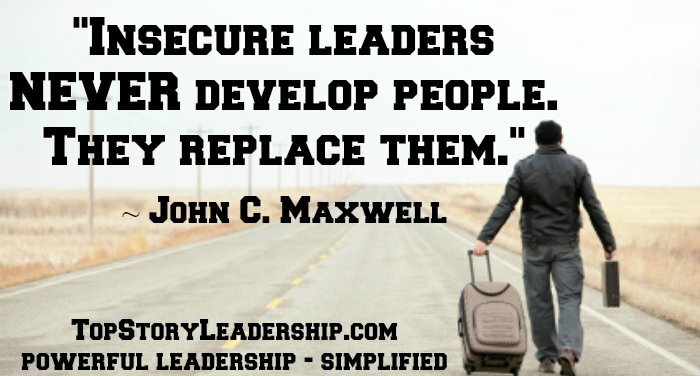 Secure leaders love to give credit to others. They don’t need it. They look for opportunities to give recognition to the team. When things go right, they look through the window and give credit to the team. When things go wrong, they look in the mirror and take the blame. They believe they somehow let the team down. They feel there was something they could have and should have done to help. Insecure leaders seek the credit. They feed on it. They look for things to go right, so they can take credit from the team. When things go right, they look in the mirror and take the credit. When things go wrong, they look through the window and blame the team. They avoid any responsibility. Remember, the leader is either making it happen, allowing it to happen, or preventing it from happening. If not, someone else is leading. Secure leaders exhibit passion. They motivate and inspire others to take action. They are most excited when they have inspired others to make things happen through motivation. They are energized when they release others to freely find their way. They trust the team to carry out the mission. Insecure “leaders” thrive on control. They give orders to move others to action. They’re most excited when they are in control making things happen through the manipulation of others. They are most energized when they get their way. They must know what is going on. Secure leaders have grown accustomed to challenging the process. Therefore, they encourage others to challenge the process. The most secure leaders want the processes they put in place to be challenged by their team. The secure leader’s motto is, “Say no to the status quo.” Those challenging the process are the most highly valued. Do you have an insecure leader? If so, I wrote MAXIMIZE Your Potential: Unleashing the LEADER Within just for you. In it, I share the principles that I applied to be promoted 14 times during my 20 year corporate career where I encountered many insecure leaders. Do you want to become a better, more secure leader of your team? If so, I wrote MAXIMIZE Your Leadership Potential: Moving Beyond Management & Supervision just for you. In it, I share the principles I learned to apply while leading leaders and their teams through over 11,000 hours of process improvement, organizational change, and cultural transformation as a consultant with no formal authority. I learned to get buy-in when their formal leaders couldn’t. If you’re interested in this subject, you may also want to check out my article, 7 Problems Insecure Leaders Cause.